The Norlin 2.4 meter yachts heading for the breakwater for some exciting competition. Approaching Stamford from the Sound, there appears to be a mirage along the shore. Rising out of the green idyllic hills is a mini-Manhattan, replete with skyscrapers of modern architecture lining a shore dotted with marinas galore. It's not your typical cruising destination. Not exactly like a trip to Manhattan by water, and certainly not an idyllic peaceful anchorage, but a worthy destination nonetheless. Years ago, I remember the industrial Stamford, where like Bridgeport, all sorts of manufacturing and warehousing was centered on the waterfront from which there was access to shipping up and down the coast. Over the last couple of dacades, those warehouses have been transformed into chic antique centers and condos, brand new condos have sprung up along the harbors with their private docks and slips occasionally available for transient boaters at $2.25 per foot, and more banks have opened offices here than any place outside of Manhattan. The Swiss Bank even moved its US headquarters here, the first major bank to leave Manhattan altogether. 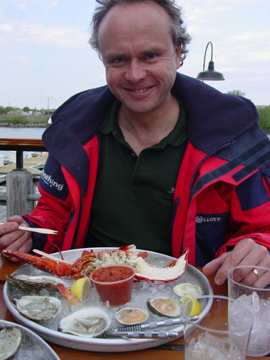 But the "real" Stamford has a rich yachting heritage, with Stamford Yacht Club, one of the oldest on the Sound, leading the charge in support of distance racing. The Northern Ocean Racing Trophy (NORT) recognizes sailors for their performance in seven offshore events. 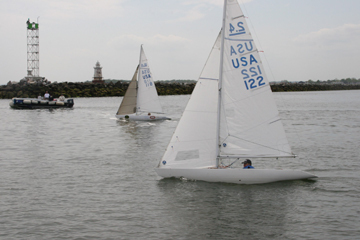 The newer New England Light House Series was instituted to encourage participation in offshore races by PHRF rated boats. This heritage together with a plethora of dock space in two branches of the harbor has turned Stamford into a boater's mecca. Of course, the wealth supplied by the banking industry helps to fuel the engines and buy new sails for the race circuit! 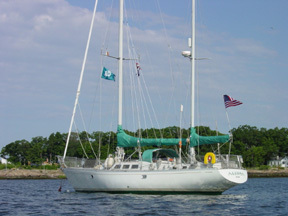 Stamford is approached by entering the outer harbor through the breakwater. Pay attention to the charts because hidden rock monsters are awaiting your unsuspecting arrival. We once tried to enter to port of the left breakwater where there appeared to be a nice anchorage with deep water and easy access to the inner harbors. We were very careful, first stuyding the paper charts, then carefully inching our way in toward the red nun at no more than 1 or 2 knots with chart plotter marking our progress when cathunk, the sound no one likes, reverberated through the boat. A quick reverse had us safely heading back to the main channel. Where we found the rock nothing at all was marked on the charts. It now bears a skull and crossbones on our personal electronic record. So, needful to say, we recommend staying in the main channels. Once inside the breakwater, there is a mooring field to the right in relatively shallow water (6-8 feet). Many of these vessels belong to Stamford Yacht Club's fleet and they do offer transient moorings to visiting yachtsmen who are members of reciprocal clubs. SYC is on VHF channel 72. The opposite side of the harbor has deeper water and was the anchorage. SYC has now put in several moorings which makes it more difficult to find a spot in which to anchor without being in too close to the barges. The barge moorings are a source of potential consternation for boaters wishing to drop a hook in a peaceful spot. Keep in mind that the tugs often work late into the night, exchanging barges from inside the harbor, as they did on the night we were there. Interestingly, we had to drop a hook as the moorings in mid-May had not yet been commissioned by SYC and so had no bridles. 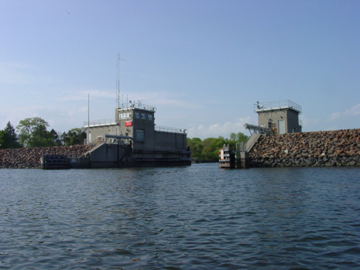 The flood gates of the hurricane barrier. Don't let them deter you from entering the harbors. There are two branches of the harbor farther inside, each marked by a hurricane barrier. This barrier was erected to protect the city against storm surge. Although the gates may appear a little daunting, there is plenty of water - both width and depth - inside. The East branch has multiple condominium complexes as well as Brewer's East Harbor Marina. This side of the harbor has limited amenities, except for an upscale restaurant, The Beacon, adjacent to the Brewer's complex with an outdoor deck, fabulous food, and pleasing modern decor inside. The Beacon is the second of Chef Waldy Malouf's trendy creations and the first outside of Manhattan. The trouble with this place is that the docks are gated and you need access to the marina to get back to your boat. Brewer's doesn't even have an office here so if you forget the code, you are out of luck. It is also quite remote from town so don't expect to saunter over to a pub. 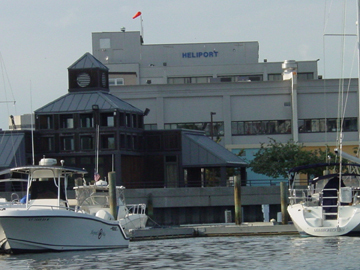 Farther up the harbor to port is a marina complex with fuel dock and helipad on the roof for those wishing a more direct connection to their boat from the City or the airport. I think I'll try that next week. (In my dreams!) The head of the harbor ends in a dead end jammed with barges and what looks like cement and cinder block manufacturing yards. That's where all that stuff from all those barges gets processed. The West branch begins with a sweeping turn to port to round the wooden barrier protecting Brewer's main facility. Their docks are well marked and the main shed carries the distinct Brewer's logo identifying the office and main facilities center. Their marina holds some of the most beautiful yachts in this part of the world, from ocean-going luxury cruisers to sleek state-of-the-art racers. I guess all those bankers have to spend their money on something, so it may as well be boats in these parts. 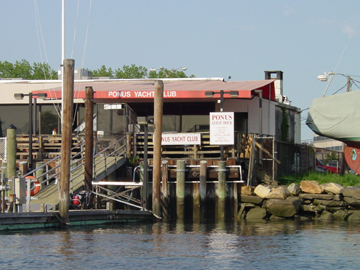 Heading up the harbor from there, next up is Ponus Yacht Club, a laid back club with friendly atmosphere. They have a dock welcoming transients. 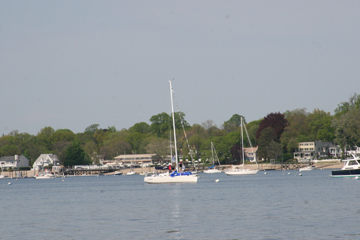 To port is Stamford Landing Marina with its gay flagpoles streaming colorful signal flags and miniature lighthouse marking its entrance. 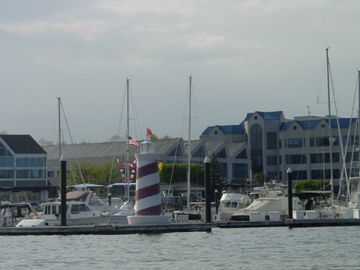 Stamford Landing Marina, across from Brewer's Yacht Haven. 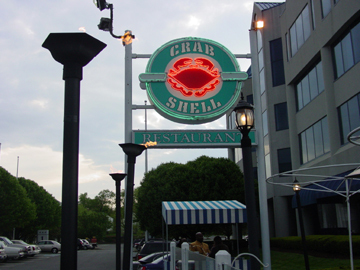 The legendary Crab Shell right on the waterfront in the West branch, just past Stamford Landing. Just toward the far end is the waterfront watering hole, the Crab Shell. The dinghy dock is the farthest one inside. 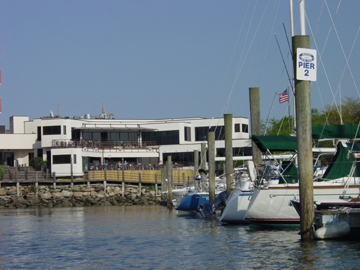 You can also pull your boat right into their slips and enjoy a seafood feast among the best in the state. We had the cold seafood platter featuring half a lobster, three shrimp, three oysters, three clams and a big tub of cocktail sauce with extra horseradish. At $23 per plate, this was a great value meal. The curly fries were well worth the extra $4 and one serving was plenty for the two of us to share. There are plenty of other restaurants, some within steps of the harbor, others downtown. Two of our favorites are Telluride (203-357-7679) for Southwestern cuisine and Chez Jean-Pierre (203-357-9526) a French bistro - reservations essential. Take a walking tour of the small quaint streets that criss cross the major arteries. It can be quite charming if you find the right walking neighborhood otherwise you'll feel like you've entered corporate central. Stamford is also known for it's nightlife, so if that's what you are after, you've come to the right place. Don't miss their annual Fourth of July seaside celebration, with fireworks set to orchestral splendor. Choose between theater, symphony, museums, arboretums, and concerts because Stamford has something of everything for everyone. The museum even has a really cool nature center on the beach where kids (an elders) can learn all about the natural environment along Long Island Sound as well as the agricultural heritage of the region and its inhabitants. Check out the list of resources below. One last thing that's great about Stamford. It happens to be on the Metro North rail line and a stop on the Amtrak Acela Express train route. That means you or your crew can easily meet up or head off for a quick trip to Manhattan. That's if you don't find enough to keep you busy right here. Alex attacking his dinner at the Crab Shell. Shrimp are already gone. Ponus Yacht Club next to Brewer's on the West Branch. Heliport and Shell Station on the East Branch.